I have had the most amazing Summer with lots of art adventures, teaching and exhibiting at home in the UK and away in other lovely places. I have been feeling so bad about neglecting my blog while I have been away but I am back to start a new term and a new Autumn season of workshops. I have got lots of exciting news about things that are happening in the next year. I'd love it if you'd join me on some of the adventures and travels that are coming up soon. 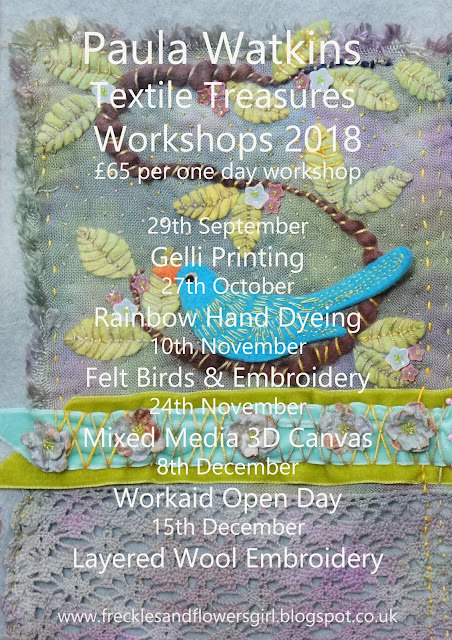 For now here is my new poster for workshops in Chesham in Bucks at Workaid. They are booking now. If you would like to join me in learning all kinds of wonderful art techniques let me know. We attended your Halloween course and we really enjoyed it. We certainly will continue to make more artistes trading cards. Go to my website to order the book! Hello, I'm Paula. I'm a Mixed Media and Textiles artist and teacher from Hertfordshire, England. Thank you for popping in and seeing what I'm up to. I've been published again! So happy! I've got a Liebster Blog Award.